The improvements are part of our wider vision for Bondi Junction. 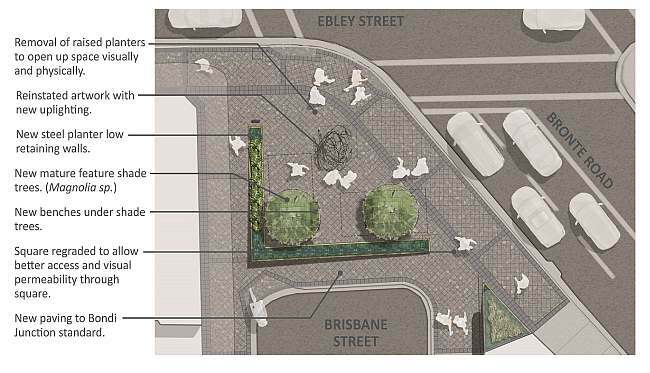 They are also part ‘Complete Streets’ – a Council initiative which aims to enhance the vibrancy of Bondi Junction and its public areas. Work will generally be carried out Monday to Friday between 7am and 5pm. We are expecting the improvements to be complete by late October 2015. The Square will remain closed during the duration of the works; however, pedestrian access will be maintained. We are also taking the opportunity to improve the Ebley Street footpath between Bronte Road and Gardiner Street. Work here will include new footpath and driveway paving and planting of four trees. There will be limited night works to complete the new ramps and kerbs. We will provide further advice to affected residents and business owners regarding the timing of the works in the near future and we will work closely with residents and businesses to maintain access to their premises. If you have any questions, please contact jack.farag@waverley.nsw.gov.au or 8306 3603.